UPDATE: OshKosh B’gosh has asked Atlanta Baby Model ASHER NASH to model for them! And ASHER AND MEAGAN were named the PEOPLE OF THE WEEK on ABC World News Tonight. In many ways ASHER NASH is just like many other 15 month olds; he likes cups, toys with music and he loves to play with his big sister Addison, 8. But he’s different than other babies too in that he was born to perform! According to his mom Meagan, 27, “When the camera is out Asher always gets a big grin on his face, like he knows it’s time to smile!” Asher also has something in common with Kim Kardashian – They’re both skilled in Breaking the Internet. 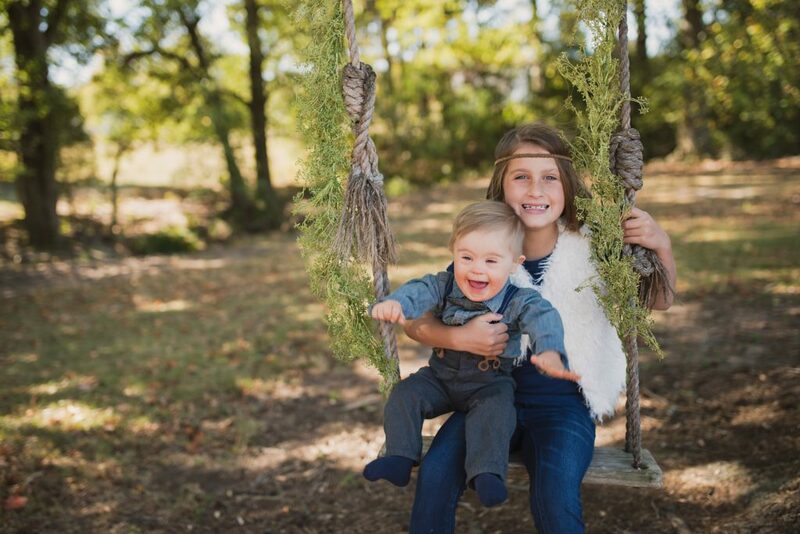 Asher loves playing with older sister Addison, also a child model. In the past two weeks Asher has been featured on CNN, CBS, ABC, PopSugar, People Magazine, US Weekly, The Washington Post, The Mighty, National Post, 11Alive, Good Morning America – the list goes on and on and on… In case you haven’t been on your computer or watching TV for the past two weeks, the nutshell version of Asher’s meteoric rise to fame: mom Meagan submitted Asher to a local talent agent calling for babies for a Carters casting. Derek Zoolander has nothing on Asher Nash! Baby Blue Steel wins! “I posted the photo of my son on Facebook with CTFOB calling on Oshkosh and it quickly caught the attention of the Internet,” said Meagan. 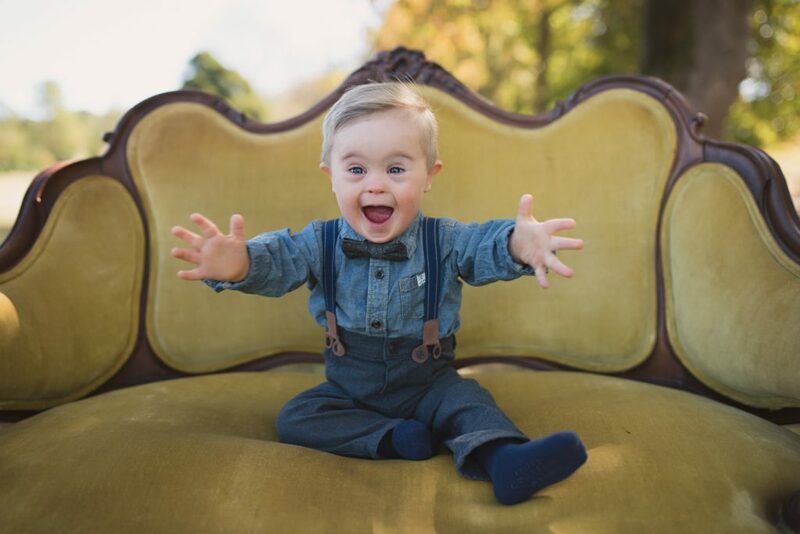 Popular Facebook page Kids With Down Syndrome shared Asher’s picture and the post received 100,000 shares and 90,000 likes in the following week. Next, media outlet The Mighty contacted Meagan to write a story, and then seemingly every outlet was contacting her. But we’re getting ahead of ourselves. 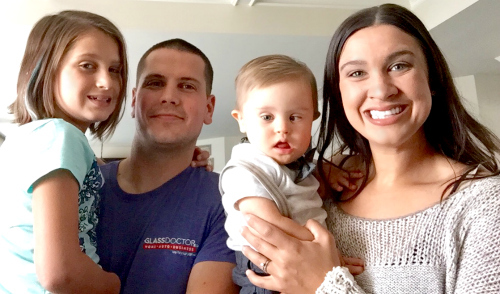 We spoke with Super Mom Meagan and got the whole scoop! Hollywood Mom Blog: How did you and your husband meet? What does he do? Do you work outside the home? Meagan Nash: My husband [David, 31] and I met through mutual friends at a social event. He is the Operations Manager at Glass Doctor. I am a stay at home mom. I worked in marketing before Asher was born, but with all of his therapies and doctors appointments we realized it would be too much [if I were] working full-time. HMB: What is Asher’s diagnosis? 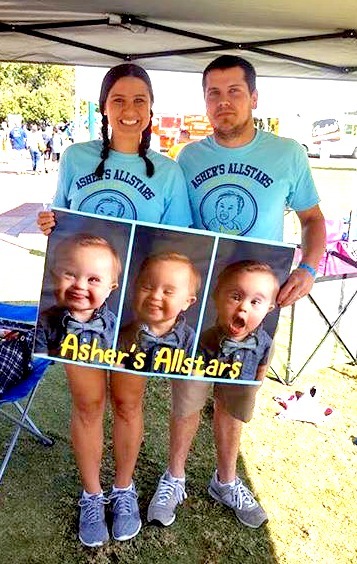 MN: Asher was born with Down Syndrome. Down Syndrome, also known as Trisomy 21, is an extra copy of the 21st chromosome. This extra genetic material manifests itself in a number of ways, most notably intellectual and developmental delays, and recognizable physical characteristics. What does that mean for our Asher? It means he might look a little different then other babies or that hitting his milestones will be challenging at times. HMB: Did you know Asher’s diagnosis prior to his birth? MN: Yes, we knew Asher would have Down Syndrome at 12 weeks prenatally. HMB: How did you prepare? And how did you all react to the news? MN: My husband (David, 31) and I prepared ourselves by becoming educated on all things Down Syndrome. We didn’t care that Asher would be born with a Down Syndrome because we knew it would never define who he was or what he did. My family was very excited. HMB: Is there a scale of mild to severe Down Syndrome? If so, where does Asher fall on that spectrum? Do you have specific growth/age benchmarks that physicians and/or therapists keep you apprised of? MN: This is exactly why I talk about Down Syndrome, so people can learn about it and end the many misconceptions they may have. There isn’t a spectrum for people with Down Syndrome. I used to think there was myself, before I had Asher, but I quickly learned there is no such thing as “high functioning” or “low functioning.” Asher will meet his milestones when he’s ready and that is just fine with us. Doctors do have a typical growth chart and a Down Syndrome growth chart. When we go for a checkup, we like to hear how he is doing on both charts. HMB: Did you join any organizations or support groups in an effort to cope and learn? MN: When I started doing my research on Down Syndrome, I came across all kinds of organizations. The two I am most involved in are Down Syndrome Association of Atlanta (DSAA) and the Down Syndrome Diagnostic Network (DSDN). I volunteer by creating welcome baskets for moms in the hospital and speaking to parents who get a prenatal Down Syndrome diagnosis for the DSAA. We just attended the annual buddy Wai in Atlanta through the DSAA and it was such an amazing experience not just for us , but for our family and friends as well. I found the DSDN when I came across a Facebook group. Their organization plays such a big role in my life personally . Their main mission is to connect , support and provide information to families with a Down Syndrome diagnosis. They have Facebook groups for each birth year and it’s only for moms with kids rockin’ the extra chromosome. I am able to talk to these moms, ask them any questions I want and know they they just “get it.” They are my village. We help each other get through hard times and deaths and we celebrate with each other no matter how small the victory. HMB: You are such a go-getter Meagan! Have you always been that way or was this an attribute that developed as you began advocating for your son? MN: I like to think I have always had that “go-getter” attitude. Growing up, if I wanted something done , I did everything possible to make sure it got done. No matter what anyone said. I will say, having Asher has made me see the world in a different way and it’s made me want to be his advocate and spread as much awareness as possible. HMB: When did you first notice Asher’s love of the camera? MN: When he was about 4 months and started really smiling , I noticed his eyes would get big and he would get this huge grin on his face when I had my phone out. I think he has always been a fan of the attention. He is definitely a little ham. HMB: Asher’s photos are excellent – please tell us about them and the photographer! MN: The photos actually came from an amazing local photographer named Crystal Barbee. I knew her through my younger sister because she had taken her wedding pictures. One day I got a phone call from her asking if she could gift me and have the honor of taking all of Asher ‘s “milestone” pictures for free! She has a brother-in-law with Down Syndrome and knew she wanted to do this for my family. Still today I cannot get over that this type of kindness exists . The pictures are from Asher’s one year birthday photo shoot taken in July. HMB: What led you to submit to the agency casting call last summer? Was this the first time you had submitted Asher? MN: I had actually submitted him to [a local Atlanta talent agency specializing in infants] months before. I have also submitted [his sister] Addison. My husband David and I are supportive of them both working in the modeling/entertainment world as long as they are happy doing it. HMB: In this business, you usually never get an agent response once you submit unless your child books the job. What was it about this submission that nagged at you and prompted you to call the submitting agent? MN: He had never been picked even one time and I think I finally just thought something was off about it. Little did I know how right I was. I would like to say the agent did realize she was in the wrong [for not submitting him] and said she would submit him to that casting and every other casting that he fit the criteria for. HMB: In a nutshell – How did this situation go viral? MN: I took to the Internet to learn more about this issue we face and found Changing the Face of Beauty. I learned about their campaign and wanted to be apart of it. So, I posted a picture of Asher tagging Oshkosh (he wears their brand the most often and [the company] is located close by). Once I posted, several [other facebook] pages shared it including the “Kids with Down Syndrome” page. It quickly started getting the internets attention. HMB: How has your family reacted to the insta-fame? MN: We’ve handled it the best we can. We are happy that the story is being read and that more awareness is being spread [about Down Syndrome]. HMB: When and How did Osh Kosh get in touch with you? MN: Once the post went viral and The Mighty wrote their story, I got a Facebook message from someone at Oshkosh about 30 minutes later. HMB: And you had a meeting with Osh Kosh this week! How did it go? MN: I can say it was a positive meeting! The after story and what happened at the meeting will air tonight on ABC World News Tonight with David Muir at 7:00 EST. HMB: With all this media attention, does Asher now have talent representation? MN: He does not have representation but we have been in touch with an agent in California and have been contacted by J. Pervis Talent Agency in Atlanta. HMB: Do you know of actors Lauren Potter (Glee) and Jamie Brewer (American Horror Story)? MN: I am aware of both actors and I think what they do is fantastic. They are showing the world that people with Down Syndrome and other disabilities can do anything they want in life. Their diagnosis doesn’t have to limit them. HMB: If you could let the world know anything about Down’s Syndrome and those affected by it, what would it be? How would you educate us? MN: Down Syndrome is a part of Asher but it doesn’t define him. We plan to continue to raise awareness and help advocate for individuals with Down Syndrome and their families. I encourage you to learn more about T21 and please feel free to contact me with any questions— And please, consider what you can do to make a more accepting and inclusive community for individuals of ALL abilities— I wouldn’t change Asher for the world but I am determined to help him change it for the better. HMB: What would you like to tell other parents, moms, in your position? Any words of encouragement/empowerment? MN: I want moms that are in the same position as me to know that you can do this! Don’t let the negative put you down. There will always be negative in the world but It’s our job as theze amazing kids moms to show the world the positive . Show them our kids can do anything they set their minds to. MN: As of right now, we are just [enjoying] the ride! Since the post went viral, Asher’s been chosen for two photo shoot gigs! Both through Kids ii in Atlanta. He did a shoot for Oball last week and Ingenuity last night. We have also been contacted by Babies R Us/ Toys R Us, Happy Family Brand, and a few others. We are hopeful he will get even more casting opportunities and gigs in the future! Who knows? Maybe you’ll even see him on The Ellen Show!